I was ten years old during the summer of 1972 and since my cousin Scott lived on a farm, we spent many summer nights in his back yard, wrapped in popcorn-filled and cream soda-stained sleeping bags under a brilliant star-filled Indiana sky. Sometimes we'd take a small battery-powered radio out with us, more to ward off unidentified night sounds than to appreciate the music, but there was one night when David Bowie's Ziggy Stardust started playing. To eight and ten year old boys, and probably quite a few adults, David Bowie was just weird, but our Star Trek and Lost in Space primed imaginations couldn't help but run wild hearing someone sing about "Spiders from Mars" while we were staring into a thick field of stars. There could be extremely strange aliens on thousands of distant worlds looking up at their night sky with the same awe and curiosity we had. And of course I knew it wouldn't be long before we found out. The summer of 1972 lay between the April Apollo 16 and December Apollo 17 Moon landings, so like almost everyone else, I believed the moon was just the beginning. We would no doubt be on Mars or beyond by the time I was actually old enough to be an astronaut, so I planned to eventually go to Mars and find out for myself. Some tiny space science saplings did manage to blossom and thrive in the open meadows left by the felled sequoias of the Apollo program and the starved, blighted attempts to grow a manned Mars mission. We built a space station that taught us valuable lessons about construction in space and expanded our understanding of micro gravity on the human body. Robotic missions abounded, giving us astounding images and increasing our knowledge of the outer planets exponentially. 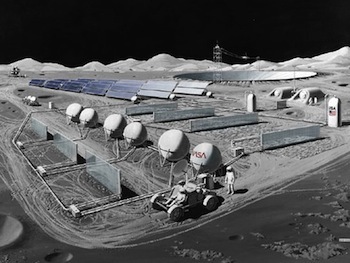 In a federal budget environment that sees space exploration science as a resource to be plundered and in a society that is much more interested in the plight of reality show stars than potentially life supporting oceans under the ice of Europa, our space sciences community has learned to do amazing things with the meager resources they have at their disposal. Nowhere is that more evident than those crafty magicians who are finding planets circling other stars. The most common method for finding exoplanets, accounting for about 85 percent of the confirmed planets found so far, fall into the Doppler Shift or sometimes called the Radial Velocity category. For those of you who didn't pay attention in physics or don't read nearly enough science fiction, a Doppler shift is generated when an object reflecting or generating light moves relative to an observer. Moving away causes its light to shift in the longer or red wavelengths and moving toward the observer shows up in the short or blue wavelengths. In recent years our measuring instruments have increased in sensitivity to the point where we can not only detect the wobble an orbiting planet imparts upon its star, but get an estimated minimum mass as well. When the planet swings around the back side of its star, it pushes the star toward us, giving it a slight blue shift and then away when the planet is between us and the star. By carefully measuring the shift in the star's color and period of the planet movement, we can determine its mass. This method works well for large bodies orbiting close and fast around their parent stars, because shorter observation periods are needed and higher mass creates more easily noticeable Doppler shifts. That's why most of the planets found this way fall into the "hot Jupiter" category. Our best instruments can detect radial velocities of about one meter per second. Jupiter shifts our sun twelve meters per second and the Earth moves it only a tenth of a meter per second. Until we get more sensitive spectrometers, smaller Earth-sized planets in more distant Goldilocks zone orbits will be harder to detect because they disturb the star less and could have an orbital period measured in multiple Earth years. The next most common, though less precise way to find planets, is called the Transit Method. A planet moving in front of its parent star blocks out a measurable amount of visible light. If this slight dimming repeats on a regular basis, then it could be a planet or a binary partner to the star. Once observation shows something is there, then the Doppler method is used to find the mass of the body to determine if it's a planet or partner star. The Kepler Space Observatory employed this approach to add more than 3,500 candidate worlds, 647 of which are Earth-sized, to the list before a pair of faulty reaction wheels shut down its precision pointing ability. At the time of this writing, there is some consideration of a possible "K2" mission to utilize the telescope's reduced capacity, but nothing definite yet. Another version of the transit method is to measure the total infrared light output from a star system. Planets radiate little energy in the visible spectrum compared to their host star, but show up well in the infrared, so the total amount of radiation observed can drop by a measurable amount each time the planet moves behind the star. 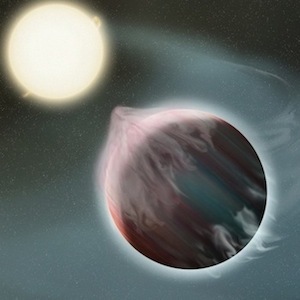 Direct observation using ground based telescopes and the Hubble space telescope have also tallied a few exoplanet finds, but optical telescopes work by amplifying light and the light reflected by a planet is faint and too easily swamped by the glare of its parent star. Current systems can pick up light source one millionth as bright as the star, but have to employ special devices like a coronagraph and wavefront control. The coronagraph simply blocks out the star making dimmer light reflected from the planet easier to see, but even then the starlight diffracted around its edges can still wash out fainter light sources and requires complex optics to direct that glare away. Wavefront controls are needed on ground based telescopes to compensate for imperfections and to automatically adjust for atmospheric distortion. This almost sounds like too much trouble to bother when we have easier and more reliable ways to find exoplanets, but unlike the transit and Doppler methods, direct imaging gathers light from the planet itself. When astronomers can do that, they have a spectrum and are able to determine the planet's temperature, see atmospheric composition and actually look for signs of life. Gravitational Microlensing is also an interesting, if less used way, to find extrasolar planets. When a small star passes in front of a larger star, its gravity works like a magnifying glass, warping and brightening the farther star's light. If a planet is orbiting the nearer star, that planet will also warp the light from the distant planet, causing it to brighten even more and for a measurable period of time. The transiting and Doppler methods rely on planets passing in front or behind a star to create a wobble or make a measurable difference in the radiation output, so they tend find mostly high mass planets in close orbits. Gravitational microlensing can see planets regardless of their orbital inclination or mass, making it a better option for discovering smaller, Earth-sized worlds that orbit out in the 1-4 AU range. The drawback to this approach is that it's a one-time shot. Once the stars move out of alignment, the show is over. The method is also a time and resource hog. Since these alignments are hard to predict, astronomers survey potential stars every few days for several years. When a microlensing event happens, special programs are used to watch for deviations from the expected light curve. If they catch the deviation early enough, they can track the entire event and determine the mass and distance from the parent star. This may sound like a rare occurrence and hardly worth bothering, but it is far more common than one might think, with some nearby dwarf stars passing in front of other stars as often as once per year. If an automated system were set up right and pointed at the Magellanic Clouds, it could watch nearly 200 dwarf stars as they pass in front of hundreds of stars. Astrometry is also a proven, yet lesser used, technique that measures the wobble generated in a star by its unseen companion. Instead of tracking a Dopplerlike effect, astrometry precisely measures the location of the target star in space, then can detect the wobble. This works well for high mass companions such as brown dwarfs and even smaller partners in a binary system, but as with the Doppler and transit methods, small Earthlike planets in a Goldilocks zone orbit don't perturb the mother star enough for our instruments to measure. Finding that planetary systems are common is really more of a relief than a surprise, but it's good to finally know for sure. Perhaps one of the most profound things we have learned is that exoplanets can be quite different than what we expected. 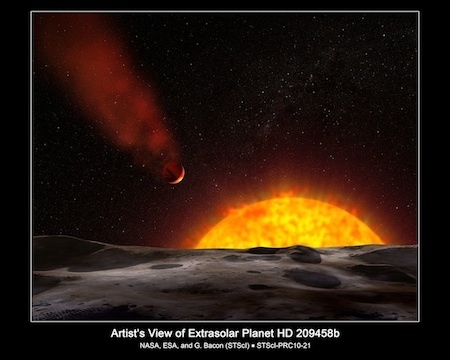 Consider hot Jupiters. These types of planets were so unexpected that when the first one was found back in 1995, it was assumed by most scientists to be a freak or anomaly, but they kept finding them. Of the thousand exoplanets found so far, more than half are hot Jupiters. Our tools are best suited to finding this kind of planet. Infrared telescopes find them because they have a large heat signature; Doppler and transit methods find them because they are in so close and are so large, they have short orbital periods and make a big difference in the wobble or change of light levels. So it's not strange that we would find them, what baffled researchers are that they exist at all. The only explanation they have so far is that the planet forms further out in the system, like our Jupiter and Saturn, then for some reason migrates inward until it gets locked in the death dance with the mother star. And a terrible death it will be. Most of these monsters are closer to their sun than our Mercury, are tidal locked and their atmospheres are constantly boiling away. As a result they have some really bad weather. Temperatures can vary by a thousand degrees between the day and night sides, causing upper level winds estimated to top out at 6,000 miles per hour. Another surprising find was the vast number of free-floating planets in our galaxy. Unlike hot Jupiters, we've actually suspected these lonely planets existed for a long time, but just recently confirmed it. The previous assumption was that an occasional planet would be flung free of its parent star and then wander the cosmos forever or until it was dragged in by another stellar body. What has surprised astronomers is the vast number of them. They are popping up everywhere and if these finds are a truly representative sample, then there could be as many as 200 billion of these rogue planets in the Milky Way. And our understanding of their origin may be skewed as well. Astronomers from Sweden and Finland have been observing the Rosette Nebula and found over a hundred small gas clouds they call globulettes. The clouds are very dense and compact, with masses equal to a planet. Unless physics in that part of the galaxy is different than here, they should eventually collapse under their own weight and form planets or brown dwarfs without the help of a stellar accretion disk. These lonely planets may provide researchers with interesting targets for a long time, because unlike those found in a typical system, these planets can be viewed directly without the glare of a nearby star. So while astronomers worldwide have come up with some ingenious ways to search for and learn about exoplanets. Another program recently announced by NASA will give them a little more help. It's called Open Source Differential Photometry Code for Amateur Research or OSCAAR (and thank the stars for acronyms). The Kepler mission photographed thousands of stars repeatedly over an extended time period enabling programs to note changes in the star's light output. These same differences in brightness can be measured by commercial grade detectors already used by amateur astronomers and small university observatories. This technique is harder to use with Earth bound telescopes, but NASA's new program will measure the light changes for all the stars in a given viewing field, then null out the fluctuations caused by the atmosphere that would be common to all the stars, leaving only the changes caused by a planet transiting in front of star. Also like Kepler, this method will only find candidate planets that will have to be verified by other means at a later date. It's unclear at this early stage how effective and useful the program will actually be, but it's almost sure to launch an entire generation of astronomers who will have hands-on experience looking for exoplanets. If you've been paying attention to space news you've probably heard that the number of confirmed exoplanets has passed 1,000 in two of the five largest databases. Do your curiosity and intellect a favor and go check out these sites. For my research on this article I actually found The Extrasolar Planets Encyclopedia at Exoplanet.eu to be the easiest to use since I could break down confirmed planets by the method used to find them. For more detailed and scientific study the NASA Exoplanet Archive may be more useful because the data can be filtered and sorted in multiple ways. I've talked mostly about techniques up to this point, so since I'm a hardware and engineering geek, I'd like to at least touch on some of the current tools in our kit. 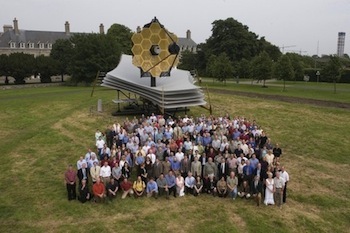 Many ground based telescopes have contributed to the exoplanet search, but the HARPS and HIRES projects have several hundred detections each. The HARPS or High Accuracy Radial velocity Planet Searcher group is from Geneva University and uses the 3.6 meter telescope at La Silla in Chile. The HIRES project or High Resolution Echelle Spectrometer is run by the University of California, Berkeley and uses the Keck I telescope at Mauna Kea in Hawaii. Both of these use the radial velocity or Doppler effect to find planets, but in recent years have spent most of their time confirming new planet candidates found by the Kepler space telescope. The MEarth project uses the transit method, is run by the Harvard-Smithsonian Center for Astrophysics in Cambridge and consists of eight remote controlled telescopes that observe nearby M dwarf stars in search of new Earthlike exoplanets. The MEarth team discovered the first super-Earth orbiting a red dwarf about 40 light years away. MOA or Microlensing Observations in Astrophysics uses a 1.8 meter telescope at Mount John University in New Zealand and the Optical Gravitation Lensing Experiment based at the Las Campanas Observatory in Chili uses a 1.3 meter telescope. Both of these teams have been successful in finding exoplanets using the microlensing technique. 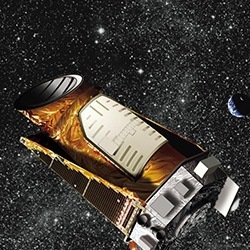 The Kepler space telescope uses the transit method and was designed to look at a fixed point in the Milky Way and repeatedly photograph tens of thousands of stars in order to find a lot of exoplanet candidates. To date it has scanned more than 150,000 stars and found 3,500 exoplanet candidates, 167 or which have been confirmed by other sources. It was launched in 2009 and completed its planned 3.5 year mission, then entered an extended mission phase that was expected to last four years, but was cut short when two of the reaction wheels that enable precision pointing of the spacecraft malfunctioned and couldn't be fixed remotely. Orientation of the unit needs at least three wheels. Don't count Kepler out yet. Mission engineers at Ball Aerospace have come up with a way to use sunlight as a substitute for the third reaction wheel. By positioning the Kepler just right, it allows sunlight to hit all the sun facing surfaces equally. Coupled with the remaining two reaction wheels, they are able to keep the spacecraft stable which will allow it to continue to scan parts of the sky, though not with its original precision. So what's next? These amazing experts, using their wiles and wits have already proved that planetary systems are indeed the rule and not the exception, but we are just at the beginning of this process. We need more data. Are planets more numerous in one part of the galaxy or evenly distributed? Are they more numerous near nebulas or areas rich in heavy elements? While we've found a few worlds of roughly Earth's size, in orbits that favor liquid water, our current tools are still not sensitive enough to detect atmospheres on planets that small. But help is on the way. There are some exciting new ground based observatories that will be coming online soon. Most interesting are perhaps the Gemini Planet Imager, a coronagraph with adaptive optics that will be attached to the eight meter Gemini South telescope at Cerro Pachon in Chile and SPHERE which will be installed on the European Southern Observatory's Very Large Telescope at Cerro Paranal in Chile. 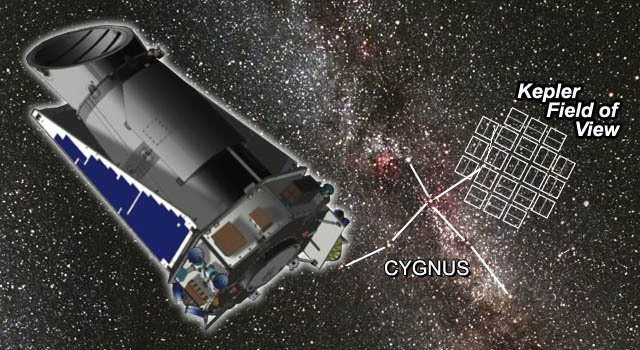 Both of these projects will attempt to find exoplanets using direct imaging. Of course I like things that fly in space, so the new generation of space telescopes excites me the most. 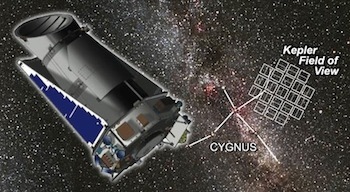 The European Space Agency's Gaia space observatory will be launched in December 2013 or early January 2014. Gaia's five year mission will boldly go to the Sun-earth Lagrange Point 2 where it will park and using a form of astrometry will continuously track the movement, brightness and position of more than a billion stellar objects, nearly one percent of the stars in our galaxy. Using a form of astrometry, it could potentially find tens of thousands of new exoplanetary systems. 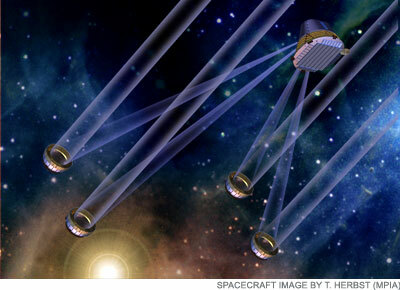 ESA plans to launch another space telescope in 2017 called Cheops. Like Kepler, it will use the transit method, but since its main purpose is "follow up" observations, it will only look at one star at a time, trying to characterize previously found planets and confirm the presence of candidate planets that have been tagged by earlier efforts. The big man on campus will be the above mentioned James Webb space telescope, a collaboration between NASA, the European Space Agency and Canadian Space Agency; it's slated to be launched in late 2018. And BMOC it will be at 13,700 pounds and nearly three times larger than Hubble. Like Gaia, the JWST will be parked at Lagrange Point two, but even though it's cold out there it isn't cold enough. A multi-layered sun shield the size of a tennis court will protect JWST's infrared instrumentation from the sun and serves as a radiator to dump excess heat and cool the telescope to a consistent 50 degrees Kelvin. That sun shield and the 6.5 meter primary mirror have to be folded into a compact brick that can fit into an existing rocket payload fairing, then successfully unfold like certain popular transforming robots once it arrives on station. This requirement has increased the complexity by adding many moving parts and raised costs to around 8.8 billion, putting its completion and launch in jeopardy several times due to budget cuts. 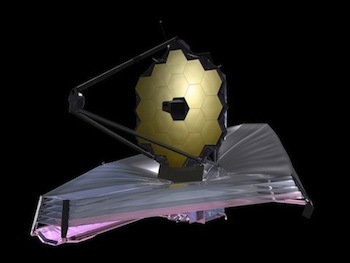 That said, the JWST should be worth the price and effort once it comes on line. Eager scientists around the world plan to use its sensitive infrared instruments for many varied projects, including an effort to study the origins of the universe itself, but our intrepid planet hunters already have dibs on time slots too. JWST will be able to actually find planets via direct observation and transit, but its most valuable contribution may be the ability to closely examine the atmospheres of exoplanets. Smaller telescopes like Hubble and Spitzer already do that with large exoplanets in the right orientation, but James Webb will be able to do it with more accuracy, for nearby Earth-sized planets. It will be sensitive enough to not only measure the amount of water and gases in the atmosphere, but in ideal situations possibly even see interesting details like oceans and ice caps. Beyond James Webb, there are a few small, specialized space telescopes planned, but nothing that will push the technological envelope significantly. Of course brilliant researchers will continue to tweak the available options, squeezing more and more out of limited resources, but if we ever plan to learn more than mass, size and atmospheric makeup of Earthlike exoplanets we'll need better tools. There is however a Holy Grail sought by planet hunters. It's called the Terrestrial Planet Finder. In 2002 NASA decided to focus its efforts along two lines of technology development, but each version has two things in common. They would have large mirrors and a means of occulting light from the parent star, enabling the telescope to see the much dimmer light or heat from an orbiting planet. The first design, with possibly the greatest potential, is the Infrared Astronomical Interferometer, dubbed TPF-I. As its description implies, this telescope would operate in the infrared range like James Webb, but that is where the similarity ends. Interferometers use a collection of smaller mirrors, linked and precisely controlled by computers, to mimic a large telescope mirror. They have been used with great success on ground based telescopes, but a space-based version requires leaping several technology hurdles. If the individual mirrors are free flying and not physically connected, then a method of extremely precise communication and control would have to be developed. Since TPF-I's inception, advancements in these technologies have come rapidly, making it seem much less of a pie in the sky approach, but a great deal of research is still needed. 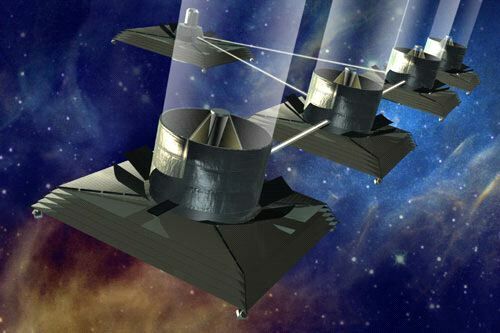 This method would also enable astronomers to adjust the distance between the mirrors and even add more units, creating an effectively larger and larger telescope. The other configuration, where individual mirrors would be physically connected at a set distance, would be easier and more robust to operate once built, but would need either human or robotic assembly on orbit. TPF-I would use a method called nulling to reduce the star's light by a factor of one million, enabling it to see faint heat emissions from planets. The second design, a Visible Light Coronagraph called the TPF-C, would be a large optical telescope like Hubble, but with a mirror at least four times larger and a hundred times more precise. This configuration would use special optics to reduce starlight by a factor of a billion and allow it to see very dim reflected light from planets. This mirror and telescope would be larger than James Webb, so would require the payload bay of a rocket like the Space Launch System or possibly lifted in smaller pieces, then assembled by humans or robots once in space. In 2004 the U.S. congress approved both avenues of research, but funding was never appropriated for either. As of 2011, both versions of the TPF telescope were listed as canceled. However, not all hope is lost. There is talk of s mission to deliver a 60-70 meter "star shade" to the area of space in front of JWST. Its design is light and rather simple except for an odd daisy-petal shape needed on the edges to break up the corona effect of the star's light. If it could be launched, deployed and precisely controlled, the star shield would provide the occulting option to the James Webb and expand its planet finding ability by being able to block out a star's brightness enough to see dimly lit planets. Budget cuts due to a drop in public interest may restrict our timelines, but that doesn't stop us from thinking big. 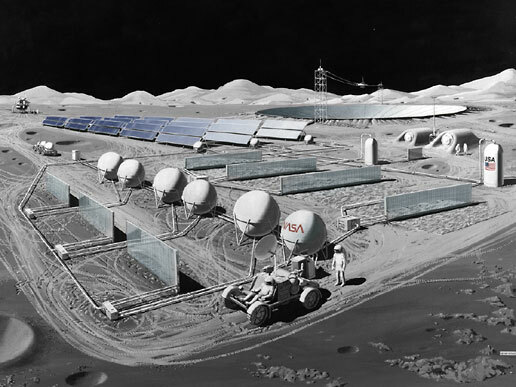 Other than pesky details of funding and cheap access to space, there is little stopping us from building telescopes on the far side of the moon. NASA has plans for a kilometers wide radio telescope to study the origins of the universe, but I'd like to see us build very large optical and infrared telescopes too. When I said think big, I meant it. If we can find a way to build an optical telescope in the 70 kilometer diameter range, most likely in the form of an interferometer, we could not only get detailed spectrographic analysis of Earthlike exoplanets we could actually map their seas and continents. Now that might produce some really interesting results. A lot has changed since those summer nights lying under the stars forty-one years ago, but perhaps the most important of those changes happened in 1992 when Aleksander Wolszczan and Dale Frail published a paper on the first confirmed planets outside our solar system. It was a point in history that might have started something wonderful. The math predicted planets and we had seen tantalizing traces, but before that discovery we didn't know. Now we do. The next important discovery in this hopefully long chain will be when we are able to confirm that a nearby planet harbors life. I wonder what we'll do then. We'll have two choices. Go or don't go. Unlike that ten year old lying under the stars and contemplating spiders on Mars, I have a firm understanding of the staggering distances involved, even to our closest stellar neighbor, but there is still enough of the kid left in me to say we have to go. Doing it will be a matter of will, money, time and ingenuity. Robots or generation ships or some sort of warp drive, it doesn't matter, but once we know, we have to go. If we aren't too afraid and can tear ourselves way from reality shows long enough, one day kids on some far away world might just stare into their sky one night and say, "Hey look. That star's getting bigger." William Ledbetter lives near Dallas with his family and too many animals. A Writers of the Future award winner, Bill is also a consulting editor at Heroic Fantasy Quarterly. Bill is also the administrator of the annual Jim Baen Memorial Writing Contest for Baen Books.